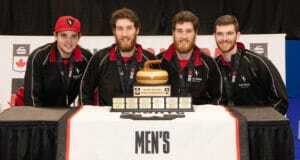 The Olympic champions stole three in the fourth end and went on to beat Anna Kubešková (3-3) of the Czech Republic 8-6 Tuesday at the North Bay Memorial Gardens to remain unbeaten after six games. 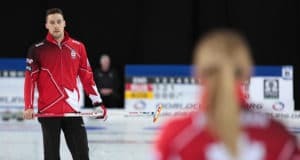 The Olympic champions looked to have the game well in hand after scoring two in the third end and stealing three in the fourth when Kubešková’s last-rock draw rubbed a guard and let Hasselborg steal three. But Kubešková and crew refused to go away, scoring deuces in the fifth, seventh and ninth ends to stay within striking distance. In the end Hasselborg, McManus, second Agnes Knochenhauer, lead Sofia Mabergs, alternate Jennie Waahlin and coaches Mari Prytz and Peja Lindholm made the shots to maintain control of the game. McManus said the Swedish foursome is playing with a lot of confidence, similar to its Olympic performance, but in a different way. 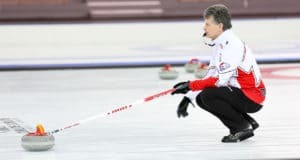 Victoria Moiseeva and Team Russia (4-2) bounced back from a potentially devasting loss to China Monday night with a solid 7-4 win over Tori Koana of Japan (3-3), scoring three deuces and controlling the game from start to finish. In the other afternoon games, Diana Gaspari of Italy (2-5) lost her second straight extra-end game, giving up three to lose 10-7 to Daniela Jentsch of Germany (1-5), and Jamie Sinclair of the U.S. (3-3) got by Binia Feltscher of Switzerland (2-4) 7-5. Canada’s Jennifer Jones (5-0), South Korea’s EunJung Kim (4-1), China’s Yilun Jiang (3-3), Denmark’s Angelina Jensen (1-4) and Scotland’s Hannah Fleming (1-5) had the afternoon byes.